Relaxing at home after work or school may be unmanageable to do at first. It is not easy to come down with your hectic schedule. However, a hanging chair is the relaxation tip No. 1 and will prove to you that you don’t have to wander far to achieve your goal. In this article, we introduce hanging and hammock chairs, and everything you should know about it. Maybe you should, but you don’t have to. If you do not want to spend a lot of time in researching, here you can find a brief overview of hanging chairs we recommend. Every of them will help you to stop thinking about work. Hanging chair is also called swing chair, hanging seat, hammock chair, swing hammock chair or sack chair, depending on the provider or material. Don’t get confused because basically all mean the same thing. However, there are still many different types of hanging chairs, which differ primarily in the materials used. We split them here into two groups: soft hanging chairs and hard (basket) hanging chairs. Soft chairs are easy to fold, are not hard or firm to the touch, breathable and very flexible. Usually, the hammock chairs were made of cotton, what makes them pleasing and subtle. They hold your body „cocooned“ in a quiet or gentle way. 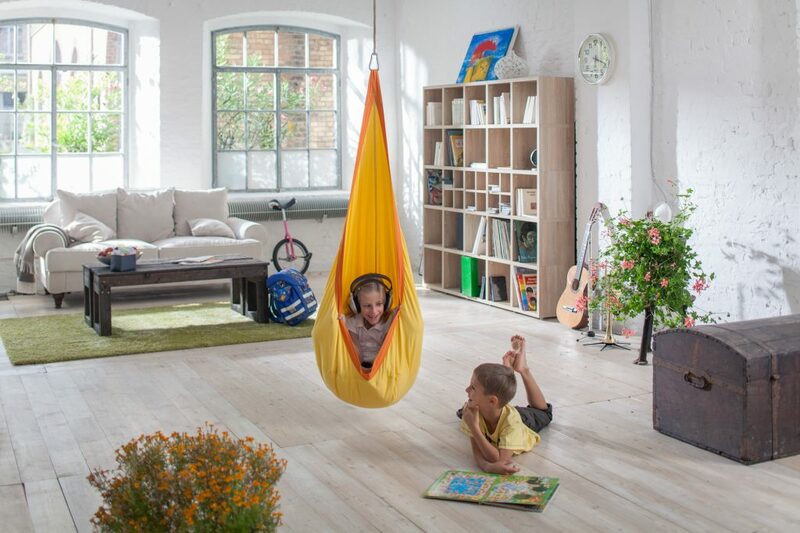 This cocoon effect is especially present at hanging nest chairs for children. Hanging Egg Chairs, which are very popular. This is completely understandable, cause the egg swings are not only stylish, they successfully combine form and function, appearance and comfort. The most famous of this kind is Nanna Dietzel’s Hanging Egg Chair designed in 1959. The Design of the “Hanging Egg Chair” has long since been dubbed timeless, whereas rattan had its golden age in the 60s and 70s when skilled wicker weavers and designers crafted beautifully formed furniture out of the challenging material. 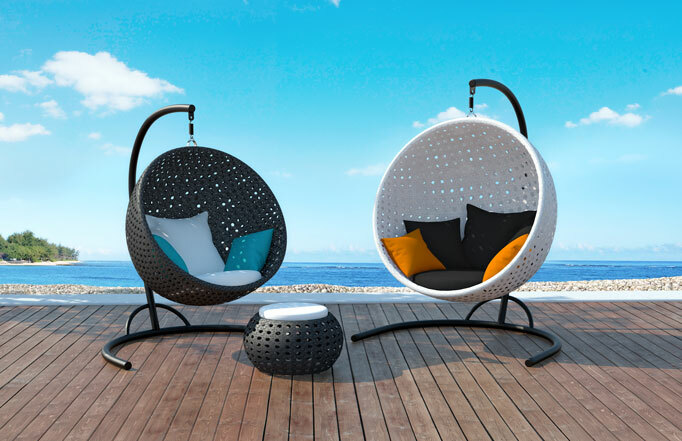 Round hanging chairs which are also known as ball chairs. The best-known is the transparent bubble chair designed by Finnish furniture designer Eero Aarnio in 1960’s. 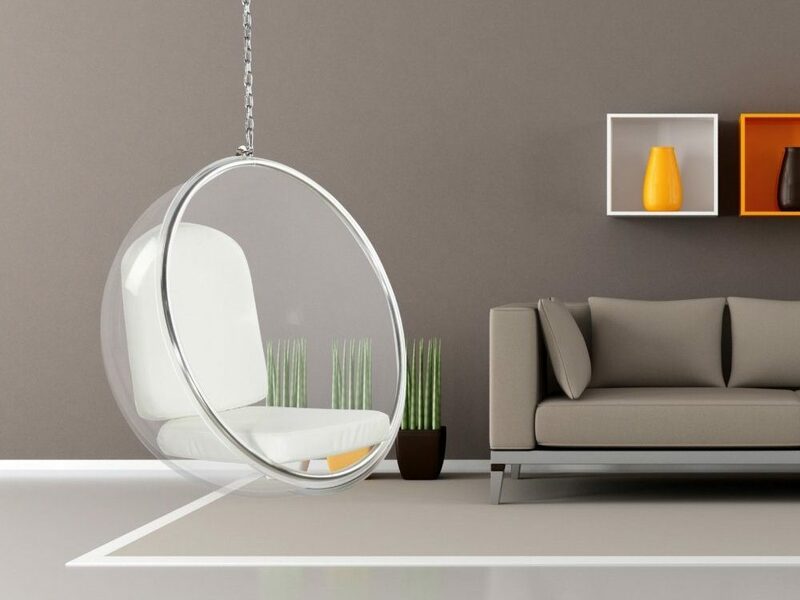 This clear round acrylic ball is most famous 60s style hanging chair, a must have for minimalist style living room. Papasan hanging chairs is an indoor basket chair traditionally made of rattan. The removable cushion is filled with cotton fluff. It looks like a big bowl, so it is also called “bowl chair”. This nostalgic bowl-shaped chair has always been known in Indonesia, Thailand, Japan, and the Philippines. In America, it was presented for the first time in the 1950s and became highly popular first in the 70’s. A version for two people is called “Mamasan”. What is actually a hammock chair? A hammock chair also called a hammock swing or canvas hanging chair, is a piece of furniture that, in its original version, consists of a piece of large cotton fabric which is stretched by a so-called spreading bar. In contrast to the regular hammock, which hangs between two points, a hanging hammock chair is attached to only one single point. 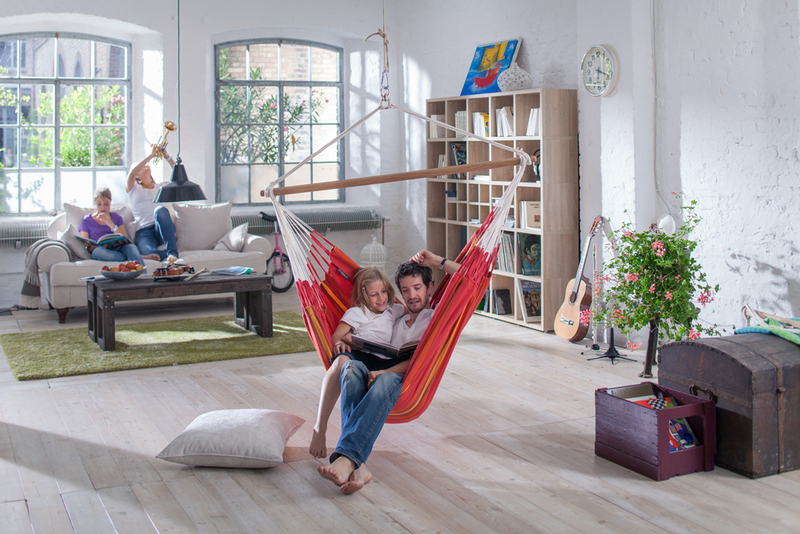 In order to make the 360 degrees rotation possible, a swivel hook is often integrated, what applies to the highly recommended and really excellent hammock chairs by La Siesta. Compared to a classic hanging chair, such as a basket chair, the hammock chair is very soft and is more suitable for relaxation than for productive work. Here is a short history tour: the original hammock chair was probably created in Europe or at least further developed. It is a modification of the classic cloth hammock, which already had been used by the Maya in South America about 1000 years ago. The hammock came to Europe in the 15th century with Christopher Columbus. Only if the cotton cloth fabric is large enough for your body, you can sit comfortably in the chair. The buying guide: basic rule here is – if you want to put yourself in the hammock chair, the long edge of the hanging chair should be at least 10 cm longer than you are. But also is very important to choose the appropriate length of the spreader bar. The large cloth in your hanging hammock chair makes sense only if it is stretched sufficiently far from the spreader bar. If the spreader bar is not long enough, you will have little freedom of movement in the hanging chair. To prevent this, your spreader bar should have a certain minimum length. The more space you need (or would like), the longer the spreader bar should be. An adult chair is normally available with spreader bars between 100 and 140 cm. For a children’s chair, it usually measures only 70 cm, although I would recommend (depending on the age or size) also a length up to 110 cm. Have you already found your perfect hanger? Very good! Now it’s about fixing: Opposite a hammock, a hanging chair, as already said, has the great advantage that it must be attached to only one single point. This makes it possible to use a hanging chair even in smaller rooms where you simply have no space for a hammock. As already said, only one fixpoint is necessary to hang your hammock chair, either indoors or outdoors. It can be hung on the center of veranda beam, hang on the ceiling inside your house, or hang from a tree branch. The right weight is when your feet are comfortably touching the ground while sitting in the hammock chair (approximately 40 cm from ground tot he bottom of seat). You can alternatively use a bolt or screw with a hammock spring attached tot he hooks, which is much more comfortable. The hammock spring is designed to make sitting even more comfortable and it protects against abrupt tensioning oft he strings oft he hammock chair. If you do not want to be tied to a certain place, you should think about installing a hammock chair with a stand. Hanging hammock chairs with frame can either be purchased as a complete set or assembled individually from a hammock chair and a hammock chair stand. Although a set is mostly cheaper, we clearly recommend investing a little bit more in better quality products. This is the only way to make sure a hammock chair has the right size and can carry enough weight. And not to underestimate – your hammock chair should also look chic. Have you already decided to purchase a hanging chair stand separately? Cool! You are looking for a suitable hanging chair stand that looks nice and is also of high quality? No problem! If you would like also a cheap one, we, unfortunately, have to disappoint you – because high-quality hanging chair stands are not quite cheap. Here you can read our reviews and recommendations – the best hanging chair stands. If you prefer clearly shaped basket chair with a focus on design and appearance, then hang-out chairs or wooden swing chairs can come into question. These sturdy and strong swing chairs have little in common with their relatives made of soft fabric and are more like a little sister of well-known patio swings.The most popular and best hanging wooden chair is the Globo Chair by Byer of Maine or the bigger one Globo Royal Swing. A hanging wooden chair is a more expensive than a hammock chair, but you’ll get a great piece of furniture which you can enjoy indoors and outdoors. The beautiful design will add a breeze of nature in every room you put it. If you want to buy a wooden chair for the garden, you should think of a regular care of the material so that your swing looks nice as long as possible. The wooden furniture usually consists of weatherproof impregnated spruce, but unfortunately, such an impregnation does not last forever. It can be washed out by regular contact with rain. You should, therefore, treat the wood once a year or at least every two years in order to keep it weather-resistant. An exterior oil finish is definitely the simplest, quickest way to treat your outdoor hanging wooden chair. A hanging chair made of synthetic rattan, also known as all-weather-wicker, is perfect for use on the terrace or on the balcony. 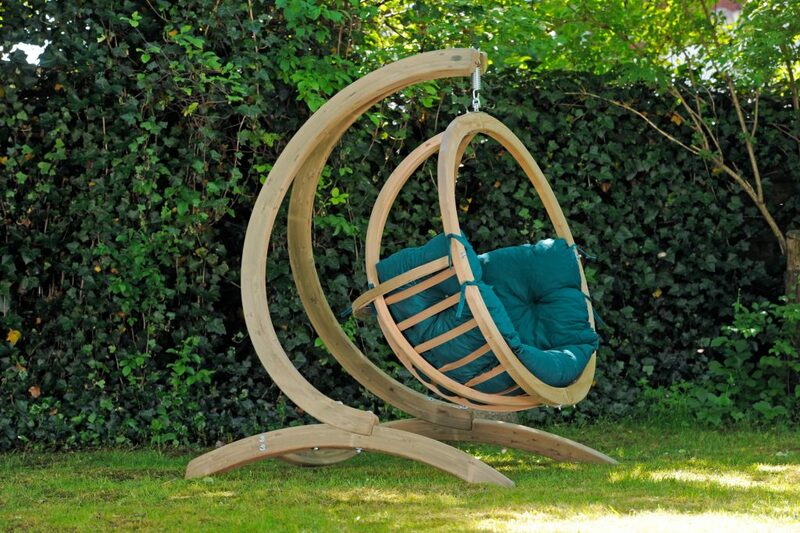 That’s why this kind of chairs is called- all weather swing chair. On the other hand, the natural rattan is made from the rattan palm trees and can be braided relatively flexible and stable under the influence of hot steam. Most (not all) wicker hanging chairs today were made from synthetic wicker which is a general concept for all kinds of plastic rattan imitates. This “plastic ratan” imitate has the great advantage over the natural variant that it is completely weatherproof. The plastic braids of the modern hanging chairs keep wind and weather virtually unlimited and therefore is perfect for outdoor use. Only the upholstery of the hanger chairs and possible metal parts are prone to weather influences or rust. The selection of hanging wicker chairs is very good and the prices are low in comparison with wooden chairs. Accordingly, there are many beautifully designed models. Hanging chairs made of synthetic rattan are therefore suitable for all people who are looking for relaxation outdoors. 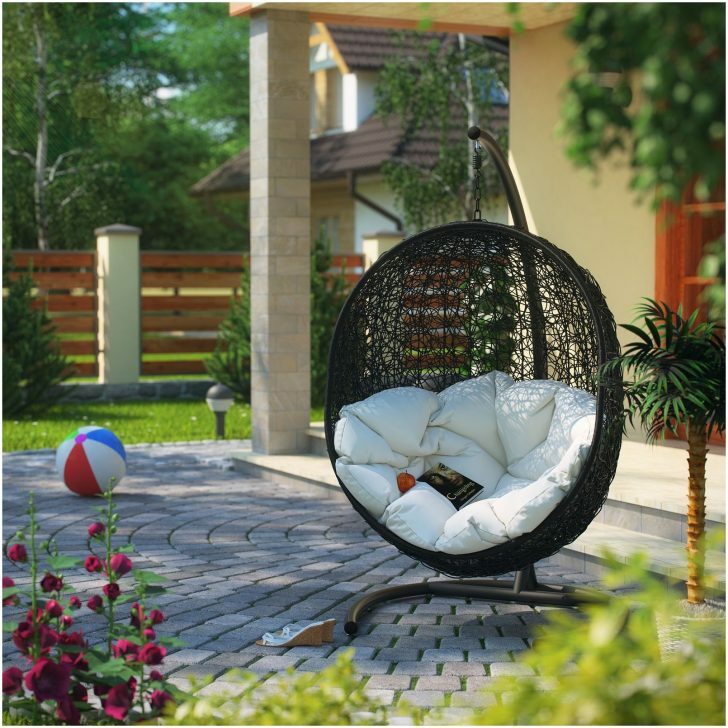 With a hanging rattan chair in your own garden, you can relax stylishly and comfortably. Often, a rattan chair is delivered directly with a suitable frame. So you do not need to worry about the purchase of a chair stand and are also flexible in the installation site. For all these reasons wicker hanging chairs are more and more popular as catering furniture. Highly recommended to restaurant owners. In the indoor area, hanging chairs made of rattan are absolutely maintenance-free. The cushions are removable and mostly washable Outside, on the terrace, on the balcony or in the garden, you should pay attention not to expose the hanging chair to strong weather and follow a few simple rules. If the hanging chair is made of natural rattan, it is suitable for indoor use. But also a hanging chair of synthetic rattan should be covered or placed indoors during the winter. Although the plastic part is almost indestructible, the metal parts in the wicker or on the frame can be rusty depending on the quality, which could lead to unsightly stains on your terrace. Hanging chairs are there where happiness meats relaxation. Everybody likes that! But especially children show a huge enthusiasm for the dynamic way of sitting. They can spin and rock and swing while sitting! A dream chair for every child! A hanging chair in the kid’s room, however, is not only fun but also a great retreat, in which children can read and dream. Here can you read, what to look for when buying a hanging chair for children. There are a lot of hanging chairs for children out there- hammock chairs for kids, indoor swings, Globo chairs for kids made of wood or kid’s bubble chairs. But we want to give preference to hanging nest chairs for children, also called hanging caves, which are enclosed all around by fabric and are therefore particularly suitable as a personal retreat for your child. Children under 3 years of age should not have their own chair since the danger of falling out is relatively high. For children up to 3 years, we recommend baby swings, which can be used for newborns too. And at the end, it is a must to mention hanging bubble chair or hanging egg chair made of fieberglass. Despite being designed and created almost 50 years ago, these contemporary hanging chairs still boasts of a cutting edge, state of the art design. Looking at this passion for perfection you wouldn’t believe that it’s a massive blast from the past.